The holidays, they happen every year and are usually a mixed bag of fun celebration and stress. There’s no way I would tell you “Try not to stress; it’s bad for you.” Stress is actually not bad for you; it’s the not recovering from stress— not relaxing to return things to balance—that is the issue. And telling someone not to stress is, well, just mean. So I want to share my holiday goal with you: Stress Less; Recover More. When we stress, the whole body tightens. That means headaches and body aches, cramps, constipation, anxiety, and often shortness of breath as well as increased blood pressure. Guess what? There’s a mineral that plays a key role in regulating the body’s response to stress— magnesium. Its relationship with its sister mineral, calcium, is a key to a healthy stress response. The role of magnesium and calcium for muscle and bone health is well known, but they have another relationship and that is with your body’s stress response. At a cellular level, the body’s resting state has magnesium inside cells and calcium outside. When the body feels “stress” (good or bad), calcium enters the cells and magnesium exits; this is how we get a “stressed” (i.e., fight-or-flight) action response triggered in the cells. With enough magnesium in your body, the magnesium recognizes what is going on and pushes the calcium back out to turn down the stress response and restore calm. This is very much like breathing in (calcium) and breathing out (magnesium). So if there is not enough magnesium compared to calcium, then the cells continue to be stressed. Think of magnesium as a superhero—the Calm Enabler—as its presence in the cells pushes that calcium back where it belongs and begins a cascade of reactions that relax the body. 1. Consider taking a quality magnesium supplement. Know that all types of supplemental magnesium aren’t created equal. 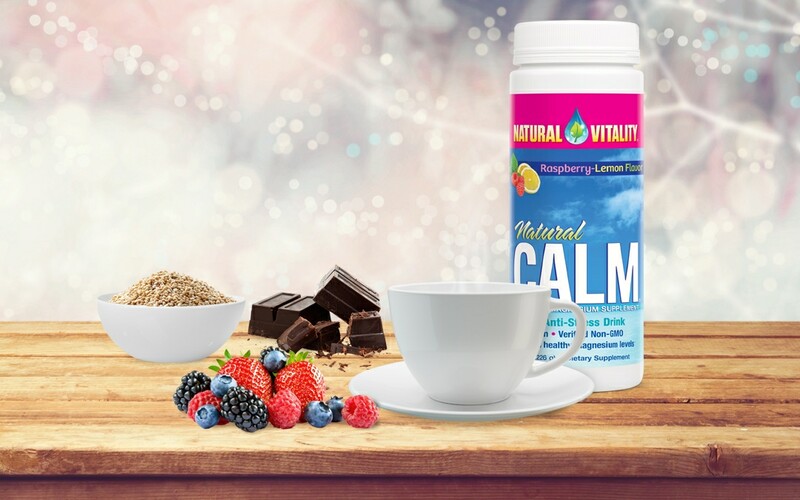 I take Natural Calm nightly because the powdered form is easy, delicious and well absorbed. Remember, digestion loses priority when the body is stressing; so a tablet, which is a less easily absorbed form, is likely not your best choice. 4. Eat cacao—yup, we are talking real chocolate. I like to add cacao nibs to my oatmeal or pancakes. 6. Choose whole grains versus flour more often. A lot of our food is highly processed, but even minimal processing—turning grains into flour—reduces magnesium. Before the holiday season begins, assess how much magnesium you get each day and amend it if necessary. You just might find yourself enjoying the joys, and stresses, of the season a bit more.